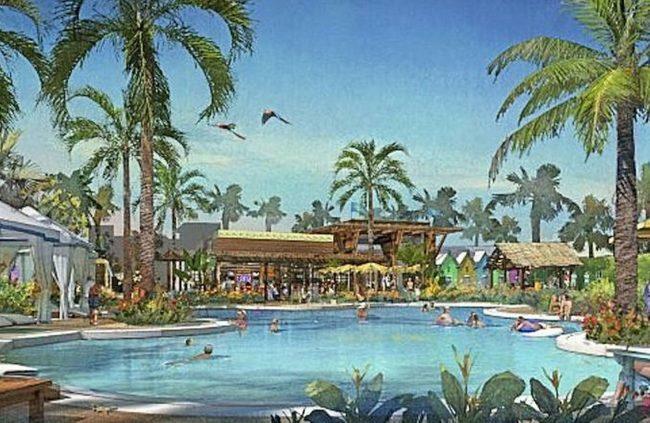 The developer of Latitude Margaritaville, a 55-and-older residential development in Daytona Beach, canceled plans to acquire more land and double the number of homes to more than 6,600. Minto Communities bought 1,581 acres for the first phase of Latitude Margaritaville in early 2017, and since then, Minto has sold 578 homes and welcomed the development’s first residents. But Minto has decided against expanding the development site by paying $26.5 million to acquire an additional 1,614 acres from Consolidated-Tomoka Land Co.
Bill Bullock, president of Minto Communities, blamed a combination of rising construction costs and higher county and city fees for infrastructure to support an expansion of Latitude Margaritaville. According to Minto, Volusia County increased traffic mitigation fees by fourfold and planned to raise impact fees, and the city doubled fees for utilities. The increased municipal fees would have covered part of the cost of widening a bridge over the Tomoka River to six lanes from two to relieve traffic congestion generated by Latitude Margaritaville and other nearby residential developments. The increased infrastructure fees, coupled with higher costs for construction materials and labor, would have forced Minto to charge unaffordable prices for more than 3,000 homes in the second phase of Latitude Margaritaville’s development. Home prices at the development now range from the mid-$200,000s to approximately $400,000. Minto will build a total of 3,400 homes in the first phase of the development. According to Daytona Beach city commissioner Rob Gilliland, the second phase of Latitude Margaritaville would have added $800 million to the city’s property tax base and would have allowed Daytona Beach to reduce its millage rate.